I learned about the passing of Leonard Nimoy a few hours after it happened when I got off of work yesterday, and I’ve been greatly saddened by his passing ever since. He was a brilliant actor, musician, and poet. He was also a great photographer, philanthropist, and a proper Bostonian. I only learned recently of some of these facts, but it still hits close to home for me because of how his famous character Spock inspired me growing up. Growing up as a young boy with Autism, I related myself to the plight of characters like Spock and Data from the Star Trek Universe. I related to Spock for his sharp wit and logical nature, and Data for his struggle to cope with emotions and the concept of acting human vs not being human biologically. Some people on the autistic spectrum do not see themselves as human because we think and feel emotions differently than neuro-typical people do. I felt the same way growing up since I was often bullied and had a hard time coping with social situations through out most of my time in school. Fictional characters are a big inspiration for me, as well as the actors who played them. When you feel alone in your struggles, then it helps most to know that you aren’t alone at all. This quote hits me right in the heart because it reminds me of how I often hunger to relive better moments from my high school and college years. I can’t have those moments back aside from reliving them in memory, but I’m happy to have had those memories all the same. It saddens me to see Nimoy leave us, but I know he lived a full and rich life. It inspires me to live a full and rich life myself while I’m still young. 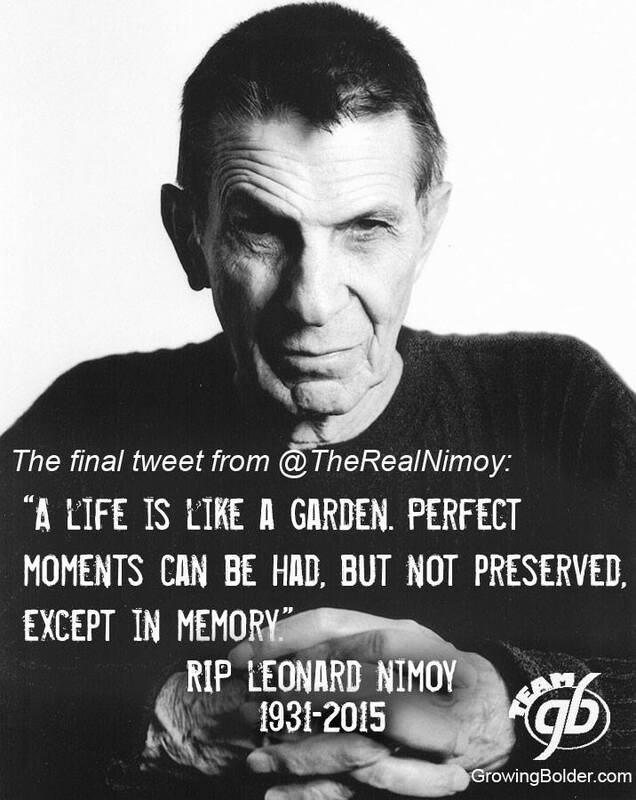 RIP Leoanard Nimoy, you were among the stars even before your passing.